You spend over half of your life in or around your home. When you think about how much time that really is, wouldn’t you want to feel comfortable in all aspects of your home? Obviously, you want your indoor habitat to be comforting and welcoming. When it comes to your outdoor spaces, are you happy? Do you have somewhere to relax? If your outdoor living spaces don’t live up to your expectations, call Outdoor Pros, the leaders in lawn service Wake Forest NC. Lawn care professionals, Outdoor Pros, have been in service for 25 years, helping folks in the Triangle sort out all kinds of issues they have with their yards and lawns. Whether you’ve got drainage issues, erosion issues, are in need of a retaining wall, or just want an overhaul on the look of your yard, lawn service Wake Forest NC professional, Outdoor Pros, has your back. We have numerous service requests over the summer for patios and custom concrete. 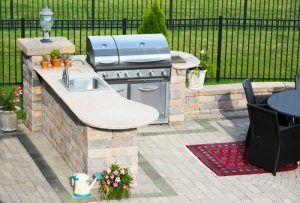 Outdoor living spaces, especially kitchens, are on the rise lately, and you can trust us to put the WOW factor in your new addition. 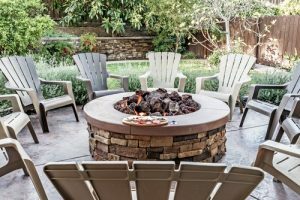 We specialize in patios, grilling areas, firepits, pergolas, seating walls, pool decks, outdoor kitchens, fireplaces, and gazebos. When you call us, we help plan and execute your project. There is no limit to what we can design for you! Our craftsmen can turn any ordinary outdoor area into an extraordinary living space. Call us today to see how we can best help you. We look forward to working with you on your project. We love serving our clients in the Triangle region, and we promise you will be satisfied with our work. We offer drainage and erosion services, landscaping installation and maintenance, turf care and more. Outdoor Pros has the knowledge and experience you can trust! ← Raleigh NC Drainage Pros Can Help You!